Managing a marketing team poses unique challenges. Has the Designer been sent this blog post? Does the Social Strategist know it’s time schedule the social media posts? Have we run analytics on this and completed the reporting? If everything feels disorganized and like a total cluster, it might be time to implement some workflow processes. We’re making it easy… because we’ve been there. We know the frustration is *real*. 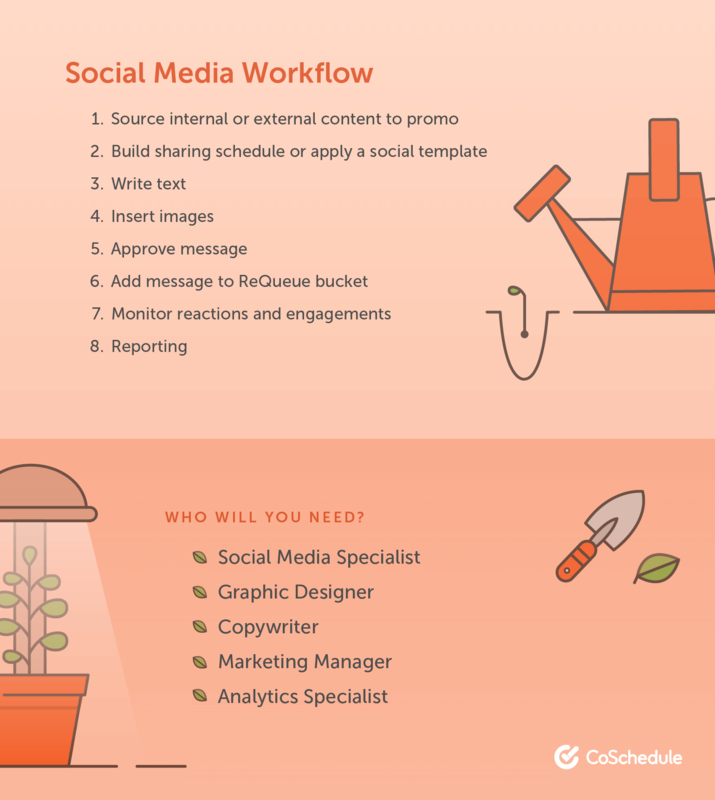 In this post, we’re giving you 5, pre-made, marketing workflows for all your campaigns. Time to get organized, fellow marketers. The number one complaint we hear from Marketing Managers is that it’s nearly impossible to maintain visibility into their marketing strategy while also keeping a pulse on who is doing what and when. This is exactly the problem our new Team Management Dashboard solves. See everyone’s workload in real-time. Drag and drop tasks to effectively delegate without a bunch of meetings. Set realistic timelines and better manage your resources. We’re finally giving you a bird’s eye view of each task your team is working on day-by-day, in one place. Say goodbye to that messy spreadsheet you are constantly trying to tame. 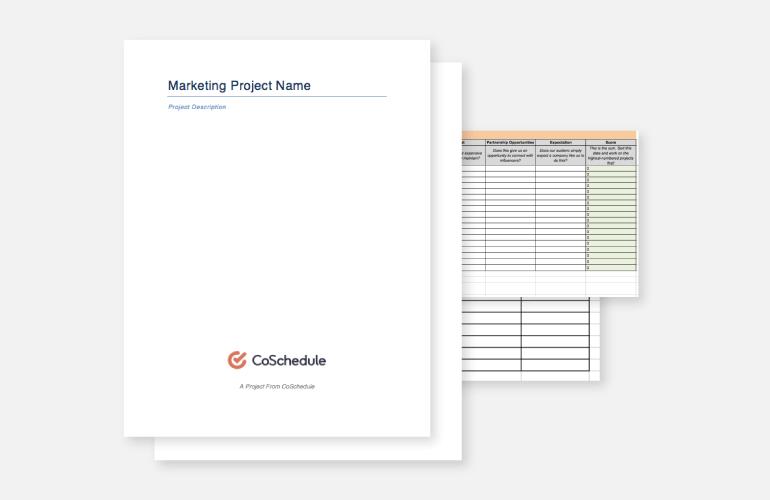 CoSchedule not only makes planning your marketing workflow a cinch, it also makes staying on top of it a reality, finally. The first thing someone will need to do is choose items to prioritize in your newsletter or email. Common examples are recent blog posts, relevant company news, an upcoming sale, new product launch, or contest. Someone on your team could choose the times on their own, or you could do a quick convo as a team to decide the content. After the items to promote have been chosen, someone will need to layout the email. Using a tool like MailChimp or CampaignMonitor makes this step quite simple. Next up, either a Designer or Email Marketer will need to add the images. If your organization wants a more branded feel to your email campaigns, consider assigning this task to a Designer. Depending on your team size, it might be necessary to assign this task to a Content Writer. Even if your team has hawkeyes and is confident that everything looks perfect, you should still include this step in your workflow. Set a special task to remind your Email Marketing Specialist to spend a few minutes reviewing their test email. Better yet, assign this task to someone else to review. Sometimes it can be difficult to spot mistakes on your own projects. They’ll want to confirm that the layout, grammar, header/footer, etc. look good on both desktop and mobile devices. This step is mostly only necessary if a separate person is responsible for reviewing the test email. This could be one task or multiple depending on how often your team needs to report on the email’s performance. You will likely assign this to an Email Marketing Specialist or someone on your analytics team. 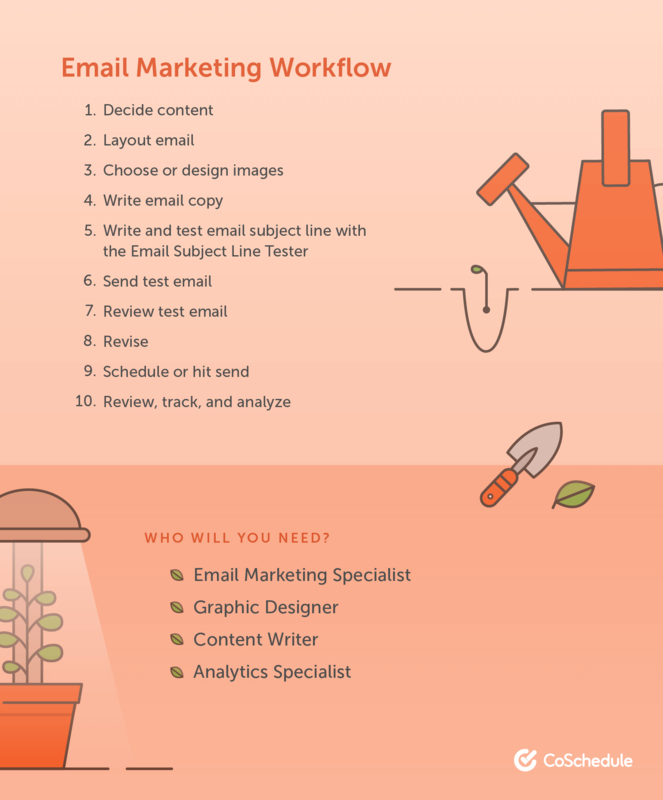 You’ll need at least one designated person to be responsible for your email marketing campaigns, but you could have up to four. The perfect example workflows for all your marketing needs! Your Social Strategist can set aside some time to find internal blogs, videos, etc. to promo. They could also use this time to peruse influencers’ content to find relevant things to share. Once a content item has been found, they should build a social sharing schedule or apply the social template. The social schedule should share the content more than one time on each channel over the span of a couple weeks. Either your Social Strategist or a Copywriter can be responsible for this task. You may need to get a Designer involved at this stage. Some networks, like Facebook, won’t let you alter the preview image on your social post, but others you can get more engagement if your image is unique. Statistics and infographics are always popular. Some teams will have an extra step here where either client or managerial approval is needed before social campaigns can be launched. If you’re a CoSchedule user. It’s good to add a reminder to add the messages to ReQueue. Doing so now means that your Social Strategist will save a ton of time later by not having to re-write and re-share the messages down the road. ReQueue does all the hard work for you. Over the next week or so, your Social Strategist should be spending some time everyday monitoring and engaging with the posts on social media. Finally, pulling together the analytics can help fine-tune future social media campaigns and strategy. You’ll need at least one designated person to be responsible for your social media campaigns, but you could have up to five. No one has an unlimited budget and the Marketing Manager, VP of Marketing or the like will need to see an outline for how much an event or conference will cost. The Event Coordinator or PR Specialist might be responsible for submitting the proposal OR it could be the Marketing Manager reporting to the VP of Marketing. Obviously, an important thing not to be forgotten when planning all the other parts of the conference. This could be assigned to a Marketing Assistant/Coordinator or to the Marketing Manager themselves. A Graphic Designer will need to design together tearsheets, marketing pamphlets, etc. You will probably also need a copywriter to help with this step. This step will also be completed by a Graphic Designer. Once the booth and marketing collateral have been designed, someone like a Marketing Manager will need to approve the items to print/order. Do you need stickers, t-shirts, buttons, pens, or other promo merchandise to give out at the booth? Someone on your team will be responsible for ordering these items. It’s likely that a Marketing Assistant or Coordinator will handle this. At this step in the workflow, the Event Coordinator or Marketing Manager will strategize about how to capture leads coming from the event and brief those attending about what talking points they should bring up when talking to visitors. Keep people before, during and after the event informed about your attendance. Supporting content can also be distributed via email. Loop in your Email Specialist for this one. Just like with email, you want your followers to know you’ll be at an event and that they should stop by your booth to meet IRL. Let your Social Media Strategist tackle this task. Will your CEO or someone from your organization be speaking at the conference? Make sure they have a branded and professional looking deck. A Graphic Designer and Content Writer can tag team this one. Going to events or conferences is a great way to build better relationships with customers or influencers. The Marketing Manager or PR Specialist can start reaching out and scheduling meetings a few weeks in advance. There’s a lot of great things we take away from events and conferences. This is an opportunity to write a blog that offers a summation of the event. You’ll need a Content Writer and possibly a Designer for this step. Once the event is completed your marketing team can pass all the leads over to the sales team. You’ll need a whole host of team members for this one. Events and conferences are an “all hands on deck” project. One of the most important things for your blog strategy is to make sure you’re developing content around 1) keywords that are relevant to your business; but also 2) keywords that you can compete and rank on. The next step is to write the blog post. Here you’ll likely assign the task to a dedicated content writer OR you can assign this step to subject matter experts across your entire organization. After the post has been written, someone should proofread. This can be assigned to another content writer, blog manager or marketing manager. Next, bounce the blog post over to a designer to create some custom graphics for the post. If you don’t have design resources you can have the content writer or blog manager insert some relevant stock images, screenshots, etc. as necessary. If there are custom graphics or images used, you may want to have a senior designer or blog manager review the work. Here, your social strategist will create a custom sharing schedule for your social media channels. If you’re a CoSchedule user, they can also simply attach a pre-made social template. Once the template has been applied or the social sharing schedule coordinated, your social media expert will write the actual copy for each message. Review & approve social messages. Some teams may need to have this step included. This step is often assigned to a marketing manager or someone who is responsible for the entire strategy. Finally, the blog manager will review the post one final time and add SEO elements like a meta description and title tag. Your core team for the blog will consist of a Content Writer, Blog Manager, and Graphic Designer. Here’s a full list of jobs you might need to accomplish this marketing task. Just as your blog team does before producing content, your paid search specialist will find relevant keywords to include in their ads. Ahrefs is a good tool for this. Together with a marketing manager and designer, your paid search specialist will determine the campaign type; how long it will run; what is needed from a design perspective; and go through talking points the ad should address. Next, your paid search specialist will define the audience for the ad set. After the audience is defined, the budget for the ad campaign will be added. 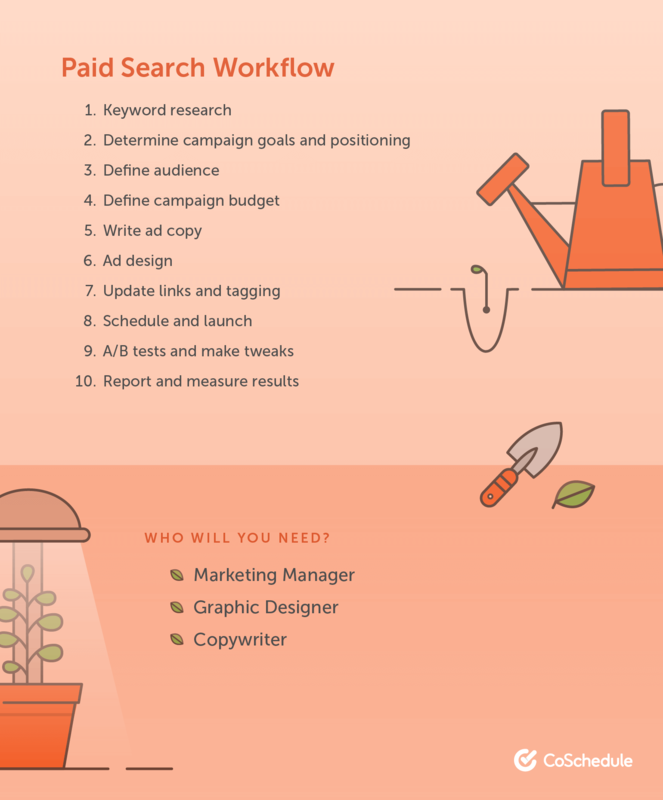 This step can either be completed by your paid search specialist or by a copywriter… depending on your team’s skills and workload. All the elements will then be pulled together by your paid search specialist and the ad will be created. The final step in the ad creation process is to make sure there are UTM tags added and all links are updated. A/B testing is an important part of a paid search strategy. Make sure there is a step in your team’s workflow to try out different copy, images, etc. and make adjustments based on what is performing the best. The final step in this workflow is to report on the outcomes of the campaign. Your Paid Specialist will likely handle this themselves. After implementing one of these templates, you’ll need to add it to your project management tool or set some sort of reminder for the team to know when their tasks are due. In CoSchedule, you can create a task template to be used on all future projects. 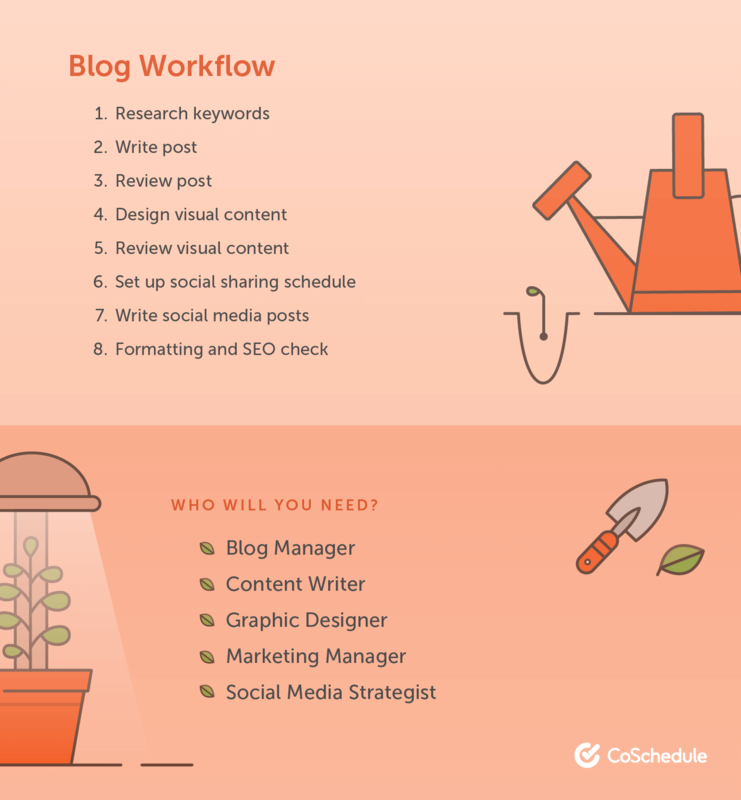 This templatizes your workflow - making your job as a Marketing Manager easier than ever. Just apply the template and it automatically assigns the tasks and populates due dates. What’s the most complicated part of all this? Managing it. After you’ve templatized your workflows, you can manage it all in real-time using the Team Management Dashboard. You’ll see complete visibility into your team’s daily activities. Every task, associated with every marketing campaign, as well as when the task is due and who is responsible for it. You can easily use the dashboard to reshuffle workloads so no one on your team is getting too much dumped on them. Simply drag and drop the task to reassign it. 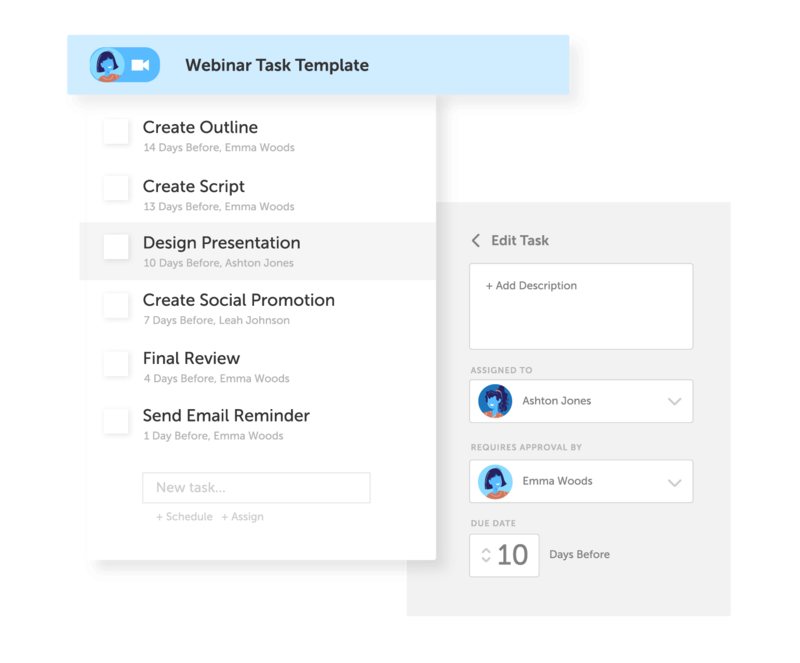 The individual will see the new task pop-up on their daily to-do list. No emails, no meetings, just marketing project management made easy. No more spreadsheeting the heck out your weekly, monthly, quarterly project lists. Now your whole team knows where to turn to get their sh*t done. AND you get to finally feel in control of all your marketing projects on a granular, task-by-task, basis.